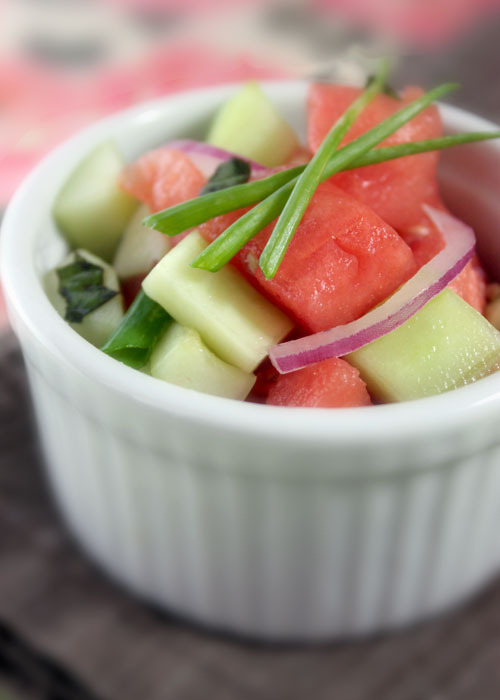 This easy and refreshing Cucumber Watermelon Salad is a guaranteed summer hit! Summer is in full swing on the Front Range of the Rocky Mountains. And, as summer heats up, so does my craving for all things barbecue. Last week we ducked into Moe’s for some Southern soul food and a hefty protein fix. Moe’s Original Bar B Que is known for its Alabama-style pulled pork, racks of ribs, chicken (and on some days, tofu) smoked over hardwood, as well as their sauces, traditional Southern sides and down-home desserts. You can find Moe’s in Alabama, Colorado, Georgia and North Carolina. Cucumber and Water Melon Make a Great Salad! One of the sides offered the day we stopped in (they vary weekly) was a Cucumber Watermelon Salad. It sounded refreshing and certainly was. Of course I had to come home and recreate it. I loved it, my husband called it “unique” (what does that mean?) and my neighbor, Hannah, enjoyed it but would have preferred it a little less heavy on the red onion. It’s all a matter of personal taste—just tweak accordingly. On stovetop or in microwave, gently heat honey. Whisk in vinegar and salt. Toss in a large bowl with remaining ingredients. I. Love. This. Salad. Period. That is all I want to say. Okay. You know me. I have more to say! This looks amazing!! We are once again traveling on the same wavelength! LOL Last night we made a honeydew/cucumber and mint salad! It was divine! I will make this one tonight. I have every single ingredient! What a beautiful salad! It's too pretty to eat! I am making that tomorrow night for our support group meeting. Our theme is cold salads. 🙂 Beautiful and healthy … a combination that can't be beat! Lexie, that salad looks so refreshing and perfect for July 4th…..thanks girl! Hugs! beautiful. this looks very refreshing! Kim – oh my, we are so on the same wavelength as always. Lori – I am honored that you dropped in : ) Love your site. Shirley – let me know how everyone likes it! Pam and Mai – Thanks for visiting and leaving sweet comments! Hmm. Would this be good with papaya? I have a bunch left over (but don't have watermelon). I can't wait to try this though! Hi Amanda, why not try it : ) I think the watermelon and cucumber are crisp and juicy. Papaya not so much. But if you try it, let us know how you like it : ) You could sub out the vinegar for lime juice to add brightness to the papaya! Lexie, thanks for sharing this recipe! What a great idea for using watermelon this time of year! I love to use fruits and veggies in season (it's cheaper too! )… I'm in charge of feeding our volunteers in a couple of weeks when our church hosts it's annual Sports Camp for the community kids… this just made my list of "sides" complete! Yea! This is glorious Lex! Such a good party salad because everyone would HAVE to try it and then everyone would NEED the recipe 🙂 I love it! We made this tonight and it was just fantastic – fresh and light. The basil and the vinegar really tie the whole thing together. Thanks! Stjinnova – Fresh and light it is : ) Thanks so much for venturing to try it and leaving a comment. NEVER NEVER NEVER microwave HONEY!!! Thanks for the tip. Do expand and educate me … I can never learn enough. Are you an opponent of baking with honey or using the microwave to heat honey? Ever since the first time I had this at Moe's I've wondered how to make it. My first attempt used cider vinegar and it wasn't quite right. Will be trying the rice wine/runny honey as soon as I get the next melon. I also soaked my red onions when I made it – which I thought worked well. Still the nice red onion flavor without quite as much bite. Alicia, oh goody, glad you know which salad I am talking about. Let me know what you think … if it's a close second to the real thing! : ) xoLexie.